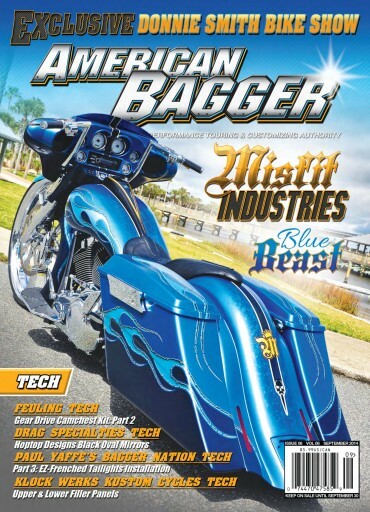 Inside this issue we cover the Baddest Bagger in Chicago and Myrtle Beach Bike Week. The Buyer’s Guide’s cover Gauges, Audio, Electronics and Lighting. The Tech Section covers Paul Yaffee’s Bagger Nation: Speed Freak Accessories Part 3, Fueling: Gear Drive Camchest Kit Part 2, Klock Works: Upper and Lower Fender Fillers and Drag Specialties: Oval Hoptop Mirrors.